Sierra, Coast, Amazon, Galapagos, this quartet of Ecuador regions make you the promise of a symphony of unforgettable memories... The best cocktail of ecuadorian flavors ! Reception at the airport by an english-speaking guide (if you are from 1 to 3 persons, your guide will also be your driver). Private transfer with spanish-speaking driver from Quito airport to your hotel. You will spend the night at Fuente de Piedra I hotel in Quito. 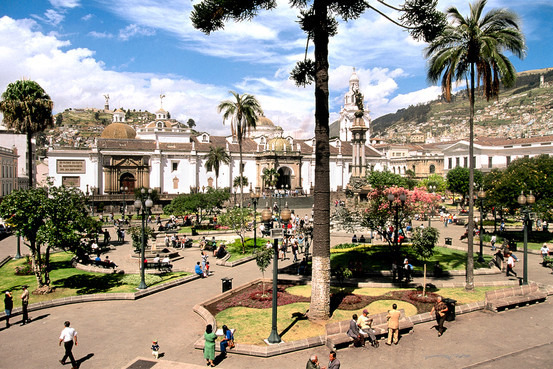 Quito, Ecuador's capital, is a real treasure between the volcanoes of Pichincha, Cayambe and Antisana. At an elevation of 2830 meters, it is the second highest capital in the world.. It was the first city classified by the UNESCO in 1978 and its historic centre is the biggest and best maintained in Latin America. Departure at 8:30am: to get a good idea of the city, we will firstly go to the Panecillo, a small hill over the city with a statue of the Quito' Virginp, with a splendid 360º view. the Grand Place where are located the Presidential Palace (Carondelet) and Quito's Cathedral. You will visit the site of the "Mitad del Mundo" where you can put one foot in the Southern hemisphere and the other in the Northern hemisphere! The different buildings corresponds to different aspects of Ecuador, with the French pavilion being dedicated to the Condamine expedition which determinated the site of this imaginary line in 1736. The visit of the museum is not included because we do not consider it of much interest. The Inti Nan etnographic museum, near the site of the Mitad del mundo, shows the country's different ethnies with their traditions and clothing. You will have the chance to realise various experiences such as water flowing and eggs balancing, which results are different on the equatorial line than in other places. English-speaking guide in a private transport (if you are from 1 to 3 persons, your guide will also be your driver). You will get out of Quito direction to Otavalo, passing through one of the regions where they grow the famous ecuadorian roses and you will appreciate a beautiful landscape made of numerous summits of the northern Andes. Visit of the Cuicocha lake in the ecologic reserve of "Cotacahi - Cayapas" , one of the most beautiful in Ecuador with a shiny blue water. At the centre of a former crater at 3064 meters, the nature lovers will enjoy a very various vegetation (orchids, "elephants ears"...) with more than 400 species identified there. Half an hour boat tour on the lake. You will see two vegetation covered island at the centre of this former crater, which had been formed by successive volcanic eruptions. You will learn more about the legends around them. Stop in Cotacachi, Ecuador's leading artisanal manufacturers of leather goods which are exported around the world. You will get to San Clemente autochthonous community, down the Imbabura volcano, where you will spend the night. A family will welcome you and invite you to share not only their house and food, but their customs and way of living. Many surprises await you, as the live-stock farming of guinea pigs or lamas, and the medicinal plants path maintained by their own users. You will spend the morning with your hosting family and discover their lifestyle, their culture and traditions. 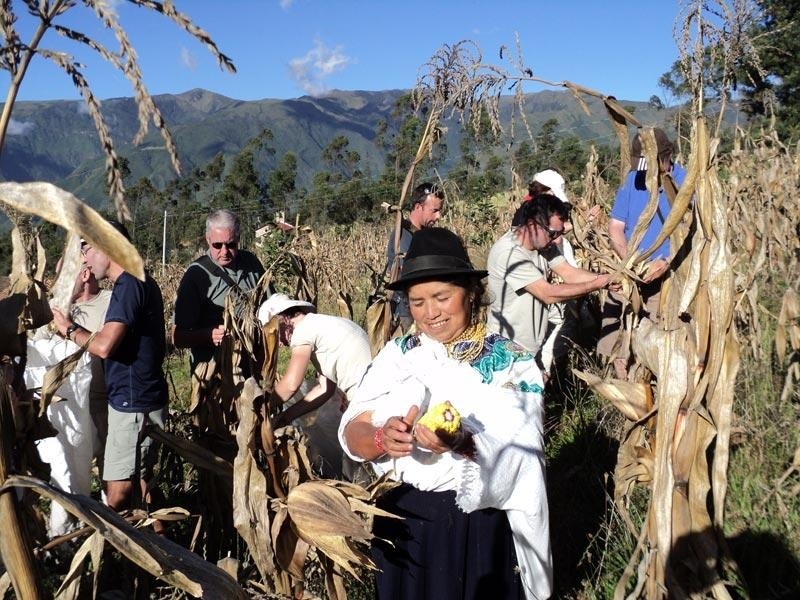 During a hike in the community with your hosts you will learn about San Clemente, its population, its craftmen, field workers, the medicinal plants they largely use, the guinea pigs husbandry, and many other things. Departure from the community for a hike in the paramo on the Imbabura's slopes. Superb views over the valleys and the volcanoes around. We will adapt this trek to the group's fitness and motivation. Visit in the morning of the famous Otavalo's Indigenous market, the most significant in the Ecuador's Andes, where you can meet the "Otavaleños" with their espadrilles, their brown felt hat and blue ponchos. They are the wealthiest indians in Ecuador and excellent sellers. The main market is on Saturdays with the cattle market just outside town. On other days the market is also hold on the Los Ponchos square. You will visit the village of Peguche, with its sacred fall and its Andean music instrument fabrication workshops. You may see a local music session and the weaving process, an art well established in the area. You will take the route towards Lasso, along the Avenue of Volcanoes. You will spend the night at Cuello de Luna Hotel in Lasso. Transfer from Lasso to get to the Cotopaxi National Park. Today visit of the Cotopaxi national park with Ecuador's second highest summit at 5897 meters. It is also the highest active volcano in the world although it mainly shows a few fumaroles from its ice covered crater. But sometimes it launches a huge column smoke and ashes right upon its center. 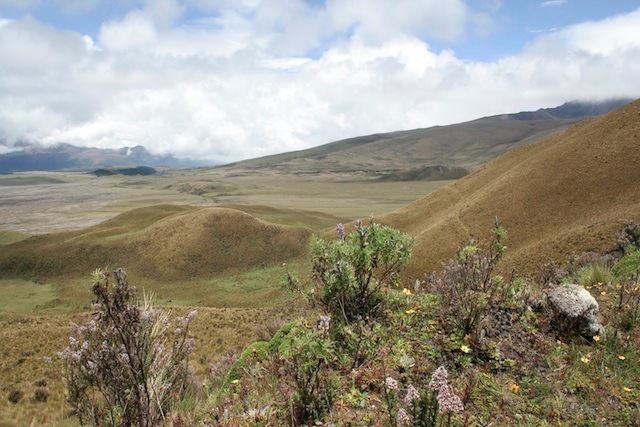 Afterward, you will walk around the Limpiapungo laggon with stunning view on the Cotopaxi. You will appreciate the flora and some fauna, typical of the "paramo", those wide plains swept by the cold winds of the Andes. After driving up to the car park at 4600 meters you will continue by foot to the José Rivas hut 200 meters higher. The most motivated can also go and reach the snowline. Due to the eruptive process of the volcano Cotopaxi initiated on August 14th, 2015, this information can be reviewed at any time, in accordance with the safety requirements of the Ecuadorian Coordination Ministry of National Security and our agency. A spectacular although seldom used roas will take you in the mountains and steep valleys where the wilderness and the beauty of the landscape will make you forget about the travelling difficulties. Feel at the heart of the Andean culture in the village of Sigchos and Chugchilan. You will spend the night and take the dinner at Mama Hilda hotel in Chugchilan. 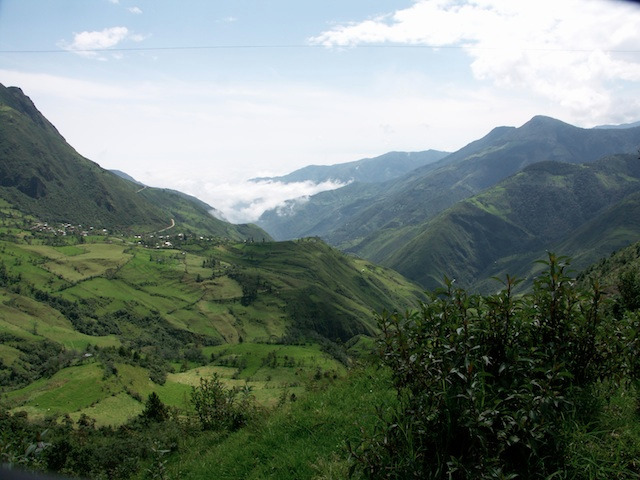 The road to Quilotoa follows the Rio Toachi's canyon to the small Andean village of Quilotoa. The emerald colored Quilotoa lake (3854m) lays in a still active volcano, its color being due to the presence of sulfur. 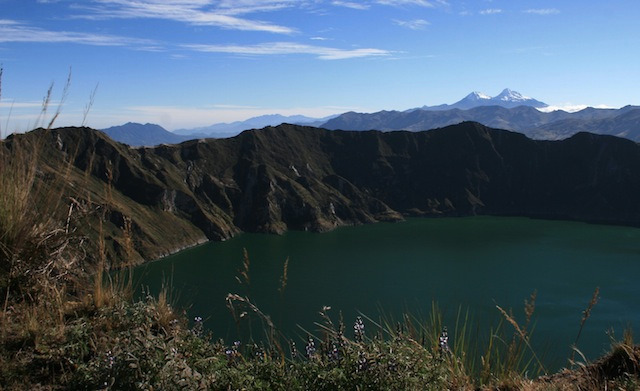 According to a legend, the Inca Atahualpa had hidden his treasure in the lake... You can go for a 2 hours walk down to the crater and back (option to rent a mule for the trip, for less than 10 u$d) or simply enjoy the view from the top of the crater. On the way to Riobamba you will stop in the area of Tigua which specialty is the colored painting on sheep leather representing the life in the Andes. Arrival in Riobamba, a peaceful Andean town totally rebuilt after the 1797 earthquake. Night at the Hacienda La Andaluza close to Riobamba. Dinner included at the hotel. Trip to the village of Alausi, the departure town for the train to the Nariz del Diablo. 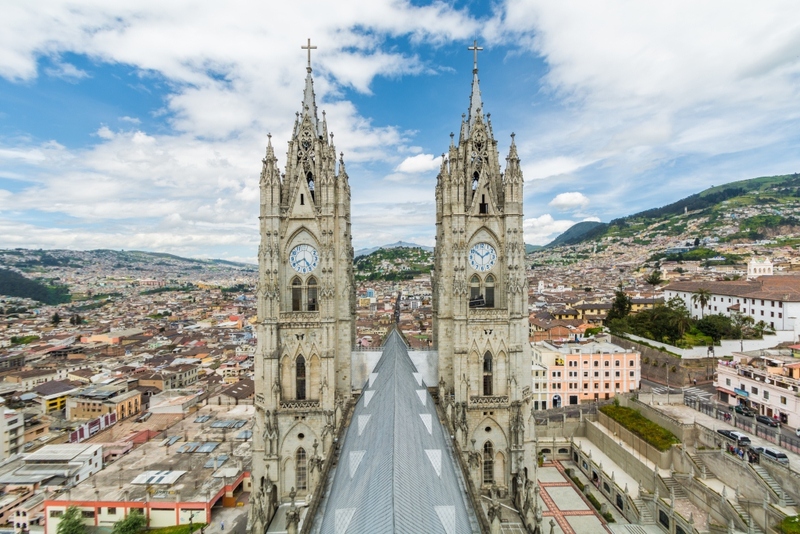 On the way you will pass the Colta lake and visit the Balbanera church, the first one in Ecuador, built in 1534. A journey in the Andes train from the Alausi station to Sibambe. The train is more modern than the former old micheline and the trip is very safe. You will pass by the "Nariz del Diablo" (Devil's nose) with successive Andean landscapes well worth the trip: highlands, forests, deep gorges, locals in their activities... You will be provided breefing about the railway history in Ecuador and the associated adventures. Return to Alausi and to your vehicle. Back on the road to travel to Ingapirca. Ingapirca means "inca stone wall" in the canari language, and indeed a site where the rock is full of legends and history. 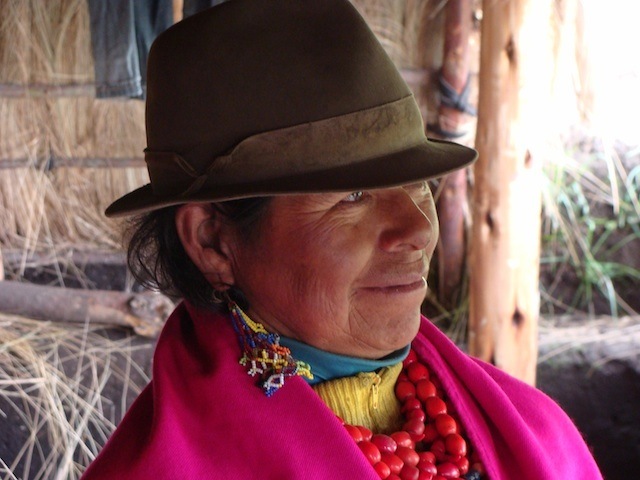 Ingapirca was founded by the Inca Huayna Capac in the XVth century. The impressive fortress used to contain a temple, sheds and an observatory with amazing exemple of mortar free stone constructions. It was though to be a tambo (relay) along the Inca way from Quito to Cuenca. The locals also see a puma's shape in the ruins. After a visit of the site you will find the Inganahui after walking a bit away. This Inca face rock sculpted by the wind and the rain may had inspired the Incas to found Ingapirca there. After returning to the main site, you will have the opportunity to visit the museum dedicated to this place discovered by the french scientist La Condamine. You will travel to the beautiful city of Cuenca by vehicle, following a scenic road in the middle of the Andes with views over the colored fields and the mountains around. Night at the Hotel Cuenca. The city of Cuenca (2 550 m) is undoubtedly as charming as its former name of Guapondelic reveals: "the valley as great as the sky". This colorful and lively city with superb historic buildings was classified as a World Heritage by the UNESCO since 1999. The best way to feel the warm colors of Cuenca is to walk around its paved streets, along the white houses with roman tiled roofs and flourishing wrought iron balconies. Colonial art treasures can also be discovered in Cuenca in the churches and convents from the XVIIth and XVIIIth centuries. The visit of the cathedral, the El Turi viewing platform, the flouring spaces, the churches and the covered market will gradually take you closer to the local life. Visit of a Panama hats workshop (except on Sundays) established in Cuenca for more than 60 years where you can observe the different stage of its fabrication, an Ecuador's specialty. Journey to the West and the Pacific Ocean to get to Guayaquil, Ecuador's biggest city and economical capital. 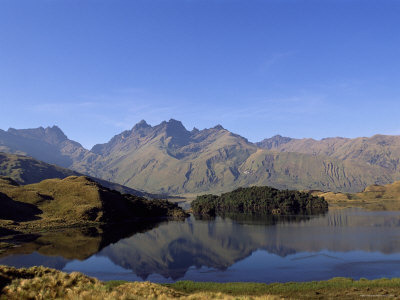 You will follow up the Western cordillera and cross the Cajas park where you will enjoy stunning views over the many lakes of this protected area. Back down from the mountains you will then pass by fertile lowlands with huge orchards and banana plantations before arriving to Guayaquil. In Guayaquil you will firstly visit the main streets, the neo gothic cathedral and the Simon Bolivar Park next to it, where you can find a hundred of green iguanas freely wandering around the park, some being a meter long. We will continue the visit to the Malecon 2000 and then reach the colonial area of Las Peñas, to admire there the architecture and the many art galleries. 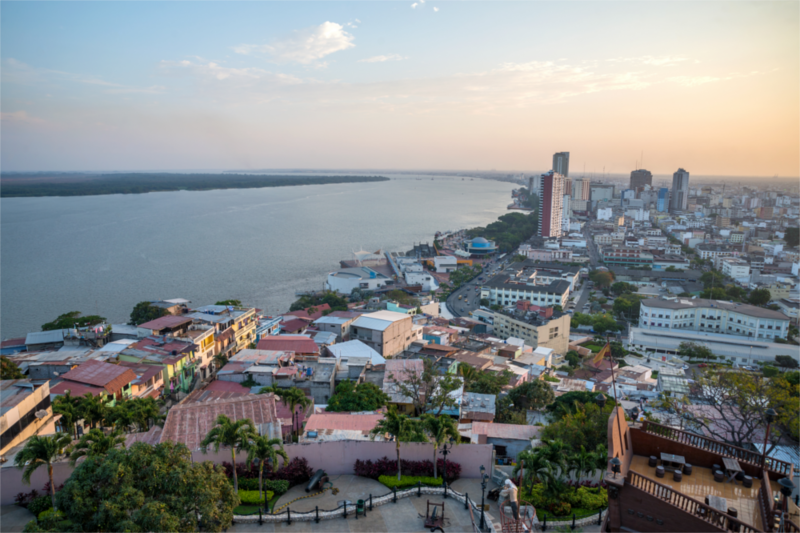 From the Santa Ana fort you will enjoy a scenic view over Guayaquil and the Guayas River. You will spend the night at hotel Palace in Guayaquil. Private transfer with your guide to Guayaquil airport. Domestic flight Guayaquil - Baltra. At the airport, after the payment of the migratory card ($20 per person) and the luggage control (20 kg maximum per person and 10kg for the hand luggage per person), you can check in and embark for a 3 hours flight. Arrival at Baltra airport, located on a small island near Santa Cruz. Santa Cruz is the second biggest island of the archipel by its surface and the most populated. You will pay the entrance fee to the Galápagos National Park ($100 per person) before picking up your luggage. You will visit the Charles Darwin Station. 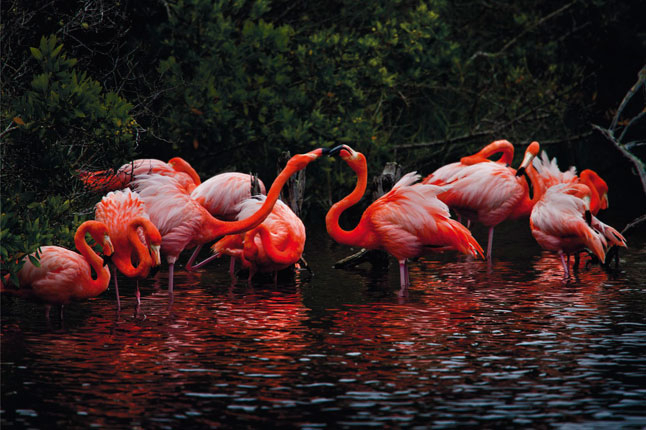 Here, you can learn about the ongoing conservation efforts on these Enchanted Islands. The Research Station rears endemic Galapagos plants, land iguanas, and giant Galapagos Tortoises for educational, scientific and conservation purposes. 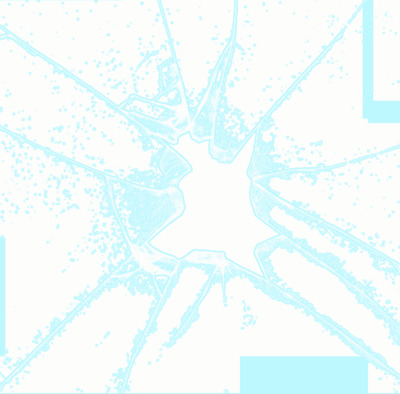 Remark 1: These price can't be paid in advance by our services, they have to be paid directly at the spots. Remark 2: If the arrival time is before 10am, you will make a visit in the Highlands, at the Twin Craters or at Manzanillo ranch to see the giant turtlesin the wild, before reaching Puerto Ayora. Night in Mainao hotel in Santa Cruz island. For this morning, we will take the public speedboat to Isabela (2:30 approx. 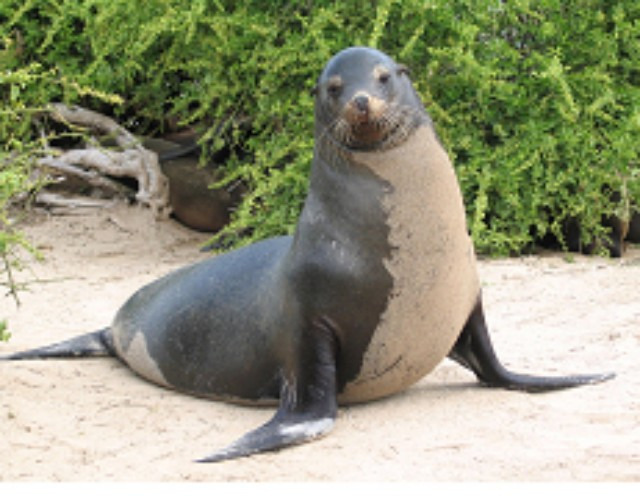 ), the largest island of Galapagos and the most wild of the three biggest ones. At Puerto Ayora harbour, your luggage will be checked again before embarking. You will need to take a taxi-boat (between $us 0.50 et $us 1 maximum per person) to reach the boat with which you will make the journey between the two islands.This service is to pay directly on the taxi-boat. At Ihe arrival in Isabela, you will need to take another taxi-boat (maximum $us 1 per person) to disembark on the island. You willl also need to pay the local tax ($us 10) at Isabela harbour. Once arrived at Isabela, you will have some time to rest at the hotel or walk around to the village. You can also head to the Concha y Perla lagoon, where you could swim if lucky with sea lions, colorful varieties of fish, sea turtles and penguins. In the afternoon, you will visit the Tintoreras Islet (20 min. from the port). 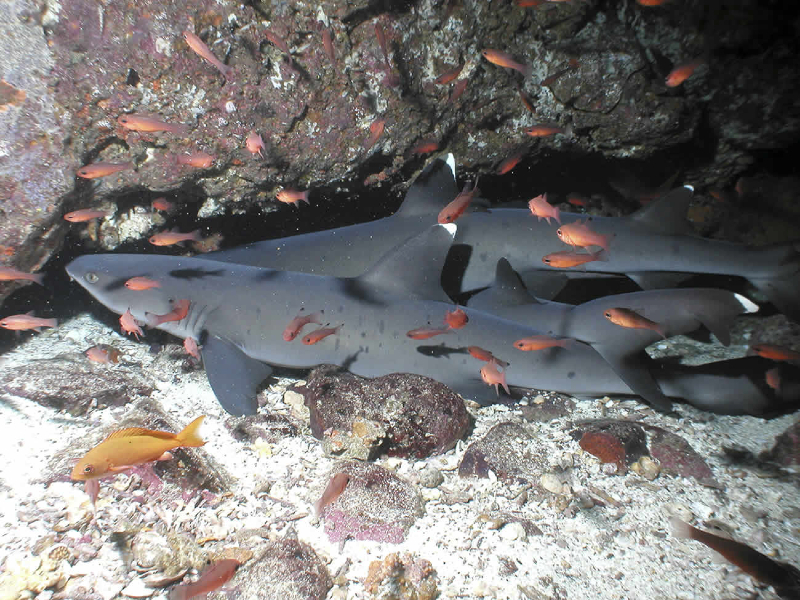 The name of the islet derives from the sharks that live in the waters surrounding the islet that have whit-tipped fins, which are known as “Tintoreras”. The islet is one of the most fascinating places on Isabela Island and in fact all of the Galapagos. In this one area we can see sea lions, marine iguanas, blue-footed boobies, Sally lightfoot crabs, sea turtles, pelicans, and Galapagos penguins. As the island is one of the main breeding sites for the marine iguanas, it is an excellent place to see numerous amounts of these creatures close-up. After the hike through the islet, we will get back on the boat and cool off by snorkeling in the waters nearby, where we can see multicolor fish, starfish, sea-urchins, and with luck manta rays, sharks, and sea lions that may swim with us close up. we ensure you that you will not forget this fascinating experience. Night in Wooden House hotel. After breakfast we will prepare ourselves to depart for the Tunnels | Cape Rosa is a site located at 40 minutes by boat southwest of Puerto Villamil. The sighting of birds and marine animals from the lava platform is one of the most important attractions. While snorkelling at this site, experience enclose encounters with many species of fish, rays, sea turtles, penguins and sea lions. During the rest of this day, we suggest to visit the Breeding Center of the Giant Tortoises and the Humid Lands on your own. Early in the morning (8:00 am aprox. ), after breakfast, we will prepare ourselves for the Sierra Negra Volcano hike by putting on comfortable walking shoes and possibly a rain jacket, making sure our cameras are stored in waterproof bags, making sure to bring sunscreen, water, and hats, and finally by preparing our box lunch at the hotel to take with us. We will then travel approximately 45 minutes by truck or bus to begin the 12 km hike (appx. 3 hours). The hike is long in terms of distance, but not very difficult as the inclines and declines are quite gradual. 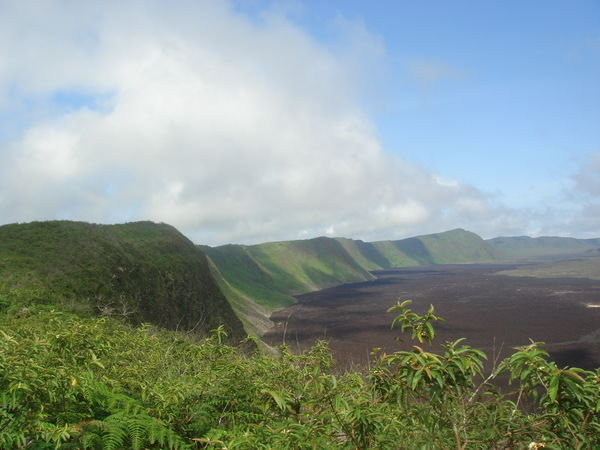 Sierra Negra Volcano has the second largest crater in the world, measuring approximately 6 miles in diameter and 300 feet deep. We will reach Volcan Chico before heading back, which should provide a spectacular view of the incredible moonlike terrain. Return to Puerto Villamil for free end of afternoon. After a short early breakfast, departure by public boat to return to Puerto Ayora. You will be taken to Baltra's airport so as to get your flight back to the continent. You will take a flight of about 2 hours from Baltra to Quito. Private transfer with spanish-speaking driver to Quito airport. Transport with an english-speaking guide from your hotel to Quito's airport (if you are from 1 to 3 persons, your guide will also be your driver). Domestic flight Quito - Lago Agrio. Upon arrival in Lago Agrio, you will go by private bus to the entrance of Cuyabeno River (less than 2 hours), where we will have a box lunch. At this point the visitors have to register in the Reserve’s office and pay the entrance fee (2$). Our Naturalist Guide will give information about the Reserve, important recommendations and other tips to begin the 2 to 3 hours navigation on the Cuyabeno River to reach Jamu Lodge in the afternoon. At that time you will be shown to your rooms and you can relax a little. 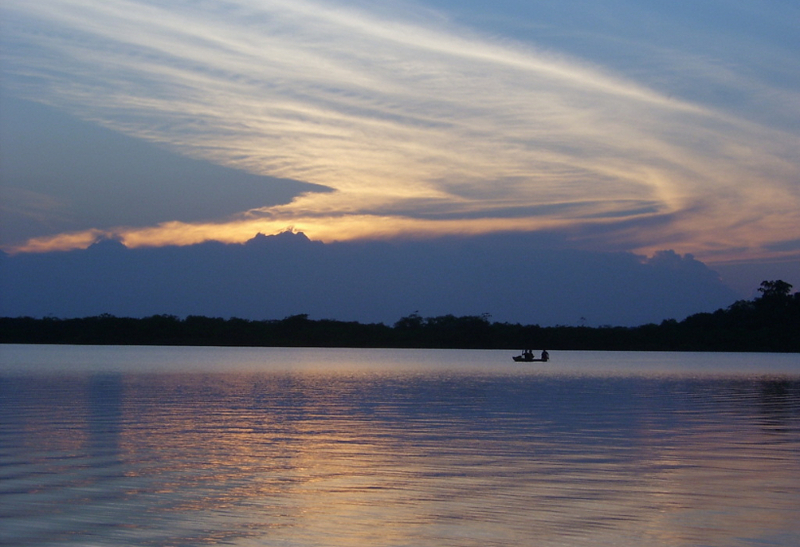 After a siesta, we will leave the camp for a swim in the lagoon and to watch a beautiful sunset in the middle of the Laguna Grande. After breakfast we will take a trek in the primary forest for 3 to 4 hours where your guide will explain how this complex tropical ecosystem works. 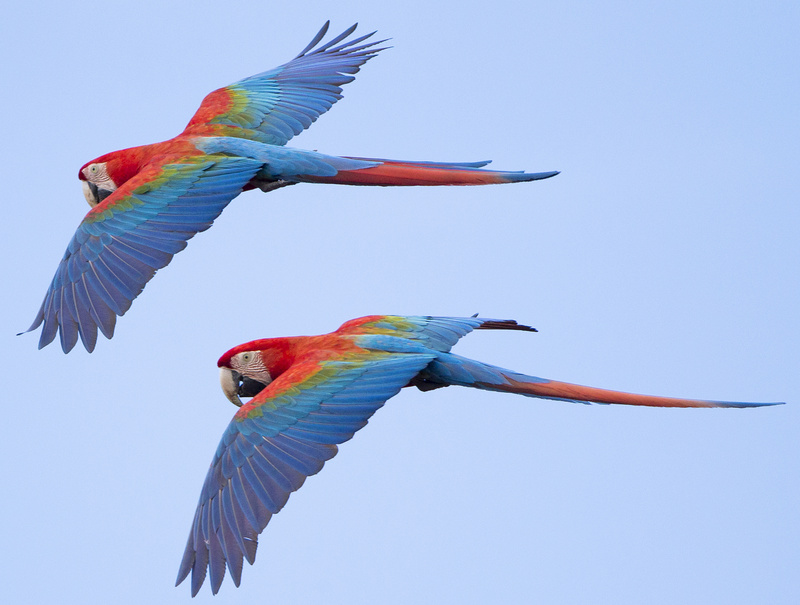 You will learn about medicinal plants and might be able to see some exotic birds or monkeys. We will then return to the camp for lunch and a siesta. In the afternoon, we will have a swim in the lagoon and watch the sunset. 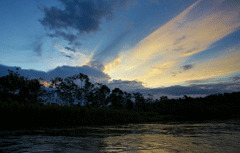 With a little luck you can observe the pink river dolphins or an anaconda sunbathing in a tree. 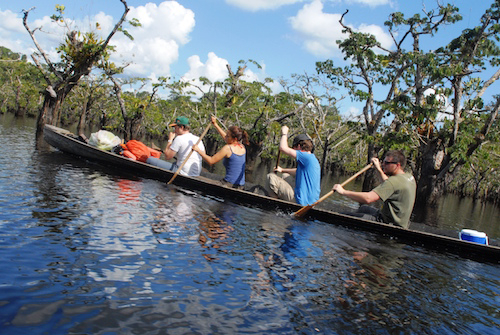 You will return to the camp for dinner, and then take a night canoe ride to look for caimans. After breakfast, we depart to head to the Siona Community of Puerto Bolivar, the largest ethnic group in the Reserve (aditional cost of 6$ to give to the community). During this tour you will learn their customs, traditions and way of life. You will be part of the elaboration of the Casabe; local dish made of yucca (carbohydrates are the principal food of the community). A visit to the Shaman is also included. He will explain some more about life in the jungle. The trip takes 1 hour navigation downstream to get there, on the way it will be possible to admire the existing fauna along the Rio Cuyabeno such as: birds, monkeys, snakes, pink dolphins, tortoises and many others. This is a full day excursion with Lunch in the Community. After that we return to the lodge to go for a nocturnal hike through the primary forest in search of insects, spiders, geckos or scorpions, and listen to the night sounds of the jungle. Early in the morning before breakfast a bird-watching excursion is optional. Back at the lodge we have breakfast and you will start the journey back upstream on the Cuyabeno River. Lunch (lunch box) at the bridge. The bus will take you to Lago Agrio. Domestic flight Lago Agrio - Quito of around 40 minutes. If some time before your taking off, go to the Central Park at 5 minutes from the airport, where you will see aligators and anaconda... A small cafeteria in the center of the park is awaiting for you with air conditionning for a nice resting time. If you have already visited the Quito Historical Center, this discovery will complement your knowledge of the city. 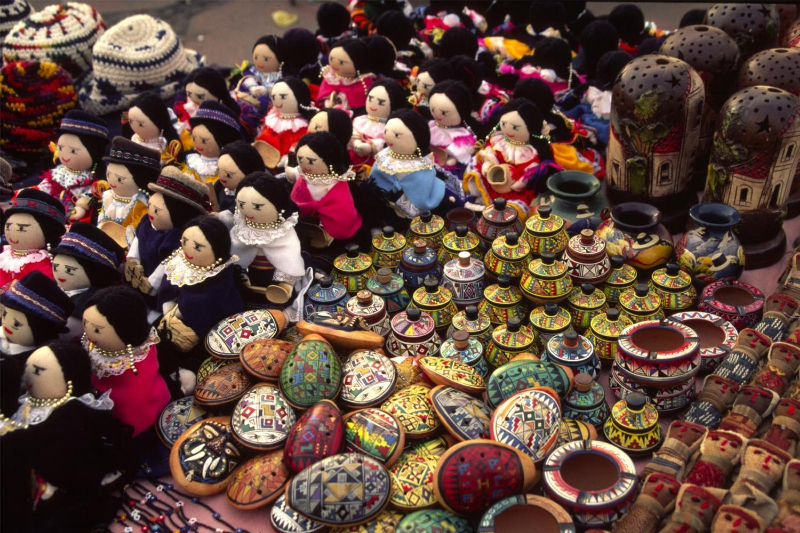 Mindalae: collection of crafts from all over the country (district of La Mariscal). Guayasamin: Colonial house dedicated to the work of the most famous modern Ecuadorian painter (one of his works adorns the walls of Unesco in Paris), and archaeological objects that he collected during his life (Bellavista district ). Cable car: a last climb to the edge of the volcano Pichincha for a last view of Quito and its surroundings. La Floresta: bohemian neighborhood with bars and terraces, designers and organic shops, to catch a last glass of craft beer or feel the atmosphere of this trendy neighborhood. 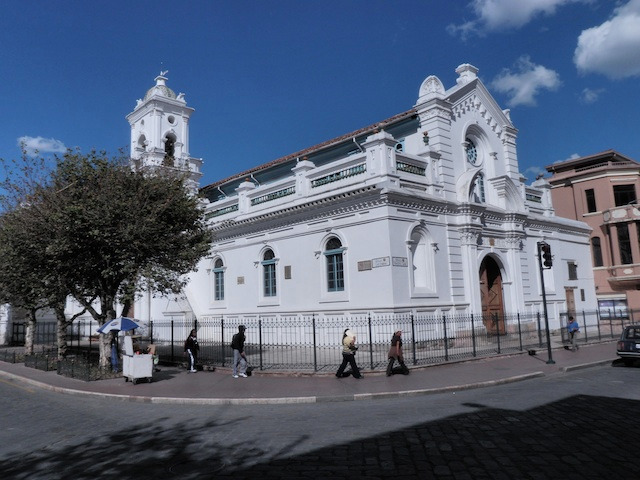 Guápulo: small village backing the city with its church dedicated to the Virgin of the Clouds. Note: the entries of the sites and museums are not included). Free connection for your international flight from Quito. According to your flight schedule, you will dispose of more or less free time.